Come Celebrate Washington's Headquarters 164th Birthday! Visit our Museum featuring over 1,300 artifacts in the award-winning exhibit, "Unpacked & Rediscovered: Selections from Washington&apos;s Headquarters&apos; Collection." 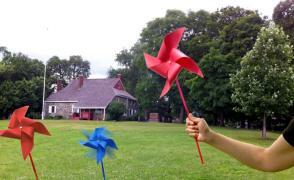 Do it in All-American style, too - make a pinwheel! Children and those young at heart are invited to make and decorate pinwheels, and watch their creations flutter in the breezes of the nearby Hudson River. Have a fun-filled family day picnicking in the park, admiring the scenery, and enjoying the holiday atmosphere. We are open 11 AM until 5 PM and admission is free for the day, compliments of Regina Angelo, Deputy Mayor. Call 845-562-1195 for further details.